The MFA in Applied Craft and Design and PNCA’s Communication Design department welcome Alex Isley as part of the 2012–2013 Graduate Visiting Artist Lecture Series. Alex Isley first gained recognition in the early 1980s as the senior designer at Tibor Kalman’s influential M&Co. He also served as the first full-time art director at the funny and fearless Spy magazine, and in 1988 founded Alexander Isley Inc. He has lectured and taught in design, typography, and exhibit design at Yale, The Cooper Union, School of Visual Arts, and Rhode Island School of Design, and has been president of the New York Chapter of AIGA. Read what Alex Isley has to say about a life of creative practice in 3 Questions with Alexander Isley. 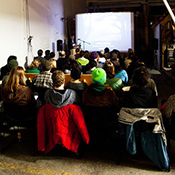 The MFA in Applied Craft and Design is jointly offered by PNCA and Oregon College of Art and Craft. The MFA in Applied Craft and Design and PNCA’s Communication Design department welcome Alex Isley as part of the 2012-2013 Graduate Visiting Artist Lecture Series. September 19, 2012. Subscribe to the PNCA Podcast in iTunes.